Blastmatic | LSP Industries, Inc. The BlastMatic line offers an air ejection system for every application from the extremely sophisticated to the very basic. The BlastMatic II is the ultimate Electronic Parts Ejector. By using the BlastMatic II's Electronic Controls you tab in the précise instant during the stamping cycle when a blast of air is to come on, as well as the length of time the air is to stay on to insure that the part is safely ejected from the die area. Costly unscientific trial and error cam adjustments are a thing of the past. 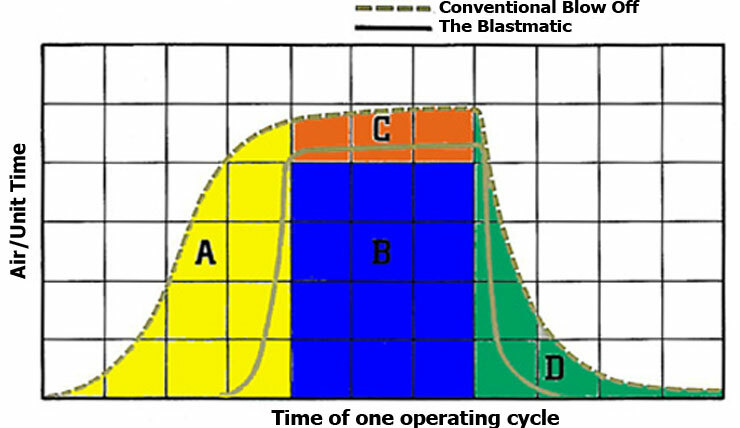 The Basic BlastMatic is an effective, economical alternative to the BlastMatic II, using some of its components less the electronic controls. 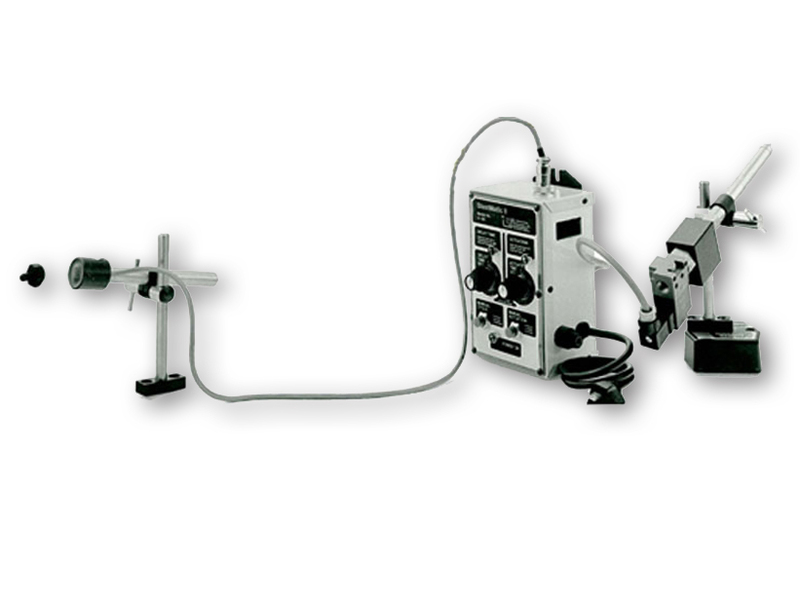 In operation, the Basic BlastMatic receives a signal from the Actuator Switch or a Solenoid Valve. The BlastMatic Nozzle Assemblies are designed with air stored 6 inches from the nozzle tip at the Univalve. When signaled by the press the Controller opens the Univalve allowing the air out the nozzle for the programmed time and duration to eject the stamped part. When the Controller turns off the UniValve goes into the rest mode. Area A: Air expended bringing the system up to force. 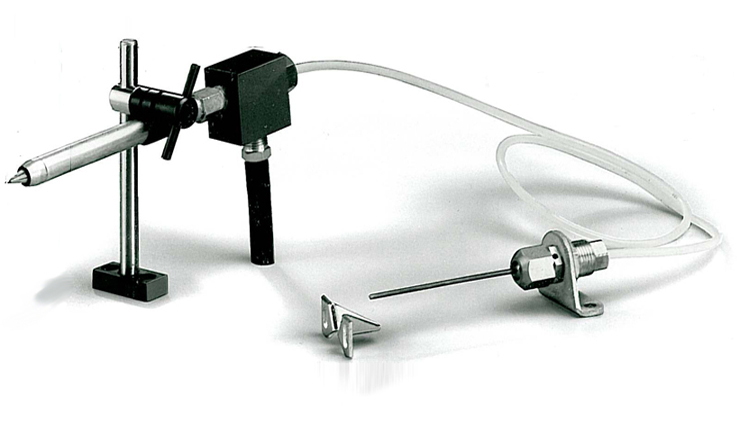 The BlastMatic II shows a marked decrease in air use, because it is valved on/off at the unit. Area B: Air requird to do the job. This area represents the absolute smallest volume of area needed to eject the part. Area C: Air wasted due to inefficiencies. 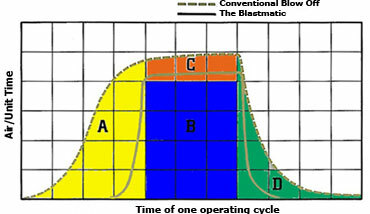 The BlastMatic II is shown to be more effective because of its focused air stream. Area D: Again, the BlastMatic II uses less air because there is no lengthy air line to be exhausted of unusable air. By using the BlastMatic electronic controls, you can tab in the precise instant during the press syscle when you want a blast of air to start, as well as the length of time it stays on. This insures that the part is safely ejected from the die area. 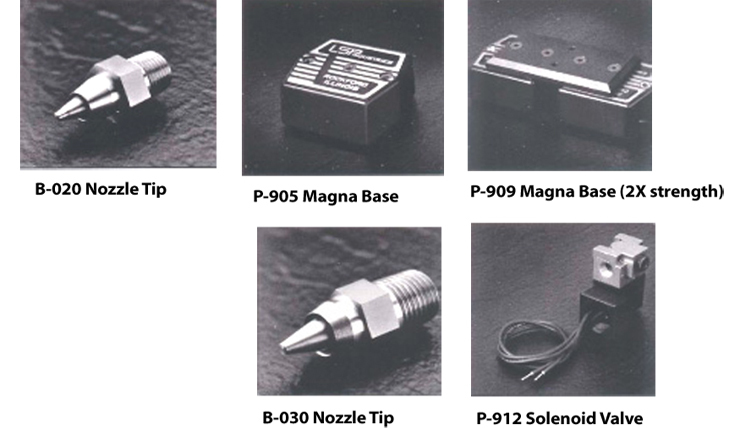 Several accessories are available to help you fit Blastatic to your applications. See the brochure for complete details.